You’ve likely heard the term, “inbound marketing”. Broken down in its simplest form, it’s the idea of attracting your buyers with valuable, helpful content vs pushing product and leading with a sale. In this post, you’ll learn the definition of inbound marketing, the buyer’s journey, the methodology behind inbound marketing, and why it’s so popular with not only marketers but buyers. Already running inbound marketing? Download our Inbound Marketing Campaign Checklist. Never miss a critical campaign component. Consideration Stage: The buyer has been able to name the problem and begins to search for a solution to their pain. Decision Stage: The buyer decides on a solution. There are four main phases of the inbound methodology all moving towards the goal of using content to draw consumers toward your website where they can learn more about what you sell on their own terms. Their own terms meaning someone searching a question on Google vs. a tv commercial in the middle of their favorite show. Each step of the way requires tweaking of tactics to achieve the overall strategy. In order to do this, we closely follow their Four Phases of Inbound Methodology. The first part of the inbound marketing methodology is to attract the right visitors to your site at the right time. Inbound puts your brand in front of prospects when they are actually in the process of looking for what you have to deliver which in the case of inbound, comes to them through meaningful, helpful, relevant content that helps them along their buyer’s journey. The convert phase is where you have already attracted your ideal buyer persona to your website (through content) and now, you need to convert them into a qualified lead by having them submit their contact information on your website via a form. Once they submit their contact information, they can join your marketing sales funnel. The key here is matching the information requested with the value of the offered content. It should be an equal exchange. This stage is critical. Essentially you are closing the sale, money in the bank. However, closing a lead and converting them into a customer can be a long process and varies from industry to industry so there isn’t a magic formula that can be applied. We can though, take advantage of some important tools to better ensure success. Just because you get the sale, doesn’t mean that the inbound process is finished and that your is work is done. It’s quite the opposite. Inbound marketing calls for the continuation of customer engagement, delight, upselling, and ultimately growing your customer base into happy promoters of your company. Do customer’s coming to you, sound too good to be true? It’s not! It’s real and it works. The inbound methodology is quickly becoming a popular strategy as audiences are changing and so are their buying habits. Customer’s expectations are higher than ever before as they are demanding a more personal, tailored relationship with the company they purchase from. With inbound marketing, you aren’t blasting a one size fits all message on an overcrowded channel. Instead, you are crafting helpful relevant content designed to address the problems and needs of your ideal customers. Thoughtful content creation builds trust and boosts your business’ overall creditability with your consumers. Inbound consumers have changed their expectations of how they want to interact with marketing material. Consumers have a lot more control than they used to with changing technology. There’s now ways consumers can block and avoid unwanted marketing tactics fairly easily such as tv commercials, pop-up ads, mailers, and telemarketers. If customers are actively avoiding your outbound tactics, it renders them useless. Given the state of the state, targeting specific personas with well-researched content tailored to their problems and pains is way more likely to be effective and earn their attention. Inbound marketing at its core is a process, which is designed to be easily scaled, replicated, and optimized. Attract, Convert, Close, Delight, and Repeat. Ready to get to work planning your next digital Inbound Marketing plan, but need a little inspiration? 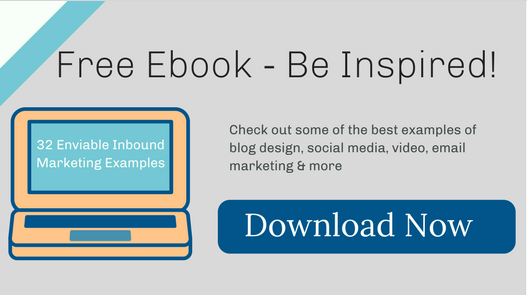 Check out our Free Ebook – 32 Enviable Inbound Marketing Examples.